James J. and Miriam B. Mulva have helped transform St. Norbert College with their generous donations, starting in 2009 with a new campus library. St. Norbert College’s first library was a small room on the first floor of Main Hall and contained books donated by students. In 1924, a room in Boyle Hall became the main library until 1959, when the library was moved to Boyle’s third and fourth floors. In 1977, the Todd Wehr Library was established through the remodeling of an existing campus dormitory. In 2009, the Miriam B. & James J. Mulva Library opened its doors thanks to the immense generosity of Miriam and Jim Mulva. Their investment in the college's library was reaffirmed with a studio-level expansion in 2013. 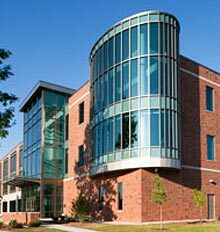 The Mulva Library serves as the centerpiece and a primary entry point for the St. Norbert College campus. More than a mere depository for materials, it provides a convenient portal to the resources of the information age and champions intellectual curiosity. Miriam (Brozyna) Mulva, who grew up close to the St. Norbert campus, attended St. Joseph Academy in Green Bay and graduated from St. Norbert College in 1969. An active volunteer, she joined the College’s Board of Trustees in 2004. James Mulva is also a De Pere native, whose mother, Phyllis Mulva Martine, worked for several years at St. Norbert College as a member of its library staff. He is a former naval officer and retired chairman and CEO of ConocoPhillips, headquartered in Houston, Texas. James and Miriam have also made considerable contributions that helped the college remodel its science building (Gehl-Mulva Science Center), update its sports center (Mulva Family Fitness and Sports Center) and add a historic St. Norbert statue named “The Conversion” at the corners of Reid and Third St.
To recognize all they have done and continue to do for SNC, the Mulvas were conferred with honorary degrees during the 2017 Commencement ceremony. Get a glimpse of St. Norbert College libraries throughout the years. It took 17 months to construct the Mulva Library and you can see it unfold in less than a minute!